1. X is the father of Y and Z. Y is the son of X, but Z is not the son of X. How is Z related to Y? 2. If ‘+’ is ‘÷’, ‘–’ is ‘×’, ‘×’ is ‘+’ and ‘÷’ is ‘–’, then what will be the value of 36 + 12 – 6 × 2 ÷ 10? 3. 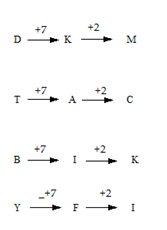 Which of the following is different from the others? 4. If CRACK is coded as 15718 and WICKET is coded as 231869, what will be the code for CRICKET? The position of first and third letters are interchanged. 6. Find the odd one. Except at all others are natural source of light. 7. Three positions of a dice are shown below. Which letter will be opposite to ‘O’? The face opposite to S is P.
From the diagram I and III it is clear that U and R are opposite to each other. Therefore the face opposite to O is Q. Direction (8-10): Read the following paragraph and answer the Questions. D is 14 meters west of A. B is 4 meters south of D. F is 9 meters south of D. E is 7 meters east of B. C is 4 meters north of E. G is 4 meters south of A. 8. If a person goes 5 metERS from F in north direction and then turn right, then he will reach which of the following point first? 9. What is the distance between points D and A? 10. Point F is in which direction with respect to Point A? 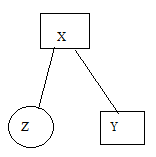 1) X is the father of Y and Z. Y is the son of X, but Z is not the son of X. How is Z related to Y? 2) If ‘+’ is ‘÷’, ‘–’ is ‘×’, ‘×’ is ‘+’ and ‘÷’ is ‘–’, then what will be the value of 36 + 12 – 6 × 2 ÷ 10? 3) Which of the following is different from the others? 4) If CRACK is coded as 15718 and WICKET is coded as 231869, what will be the code for CRICKET? 6) Find the odd one. 7) Three positions of a dice are shown below. Which letter will be opposite to ‘O’? Direction (8-10): Read the following paragraph and answer the Questions. D is 14 meters west of A. B is 4 meters south of D. F is 9 meters south of D. E is 7 meters east of B. C is 4 meters north of E. G is 4 meters south of A. 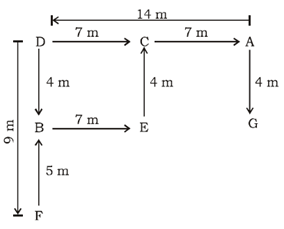 8)If a person goes 5 metERS from F in north direction and then turn right, then he will reach which of the following point first? 9) What is the distance between points D and A? 10) Point F is in which direction with respect to Point A?